The incredible amount of time and resources invested in youth sports would beg the question: What are we doing? Are we over-indexing? Are we too focused on winning? On specialization through year-round training and development? In my own experience, the answer is yes to the above questions. I’ve watched coaches at young levels – K through 7th grades – actually spending time in practice preparing for an opponent, versus developing each individual player’s skillset and developing a cohesive team. I’ve watched one individual, for three straight years, control the entire environment around a youth girl’s basketball team. He didn’t want any help, and he didn’t want any other outside influence. The development of the team and many of the players suffered as a result. I’ve watched youth coaches breaking clipboards, kicking chairs, and screaming and yelling. Just remarkable behavior that doesn’t reflect our objective as stewards of these young athletes. But striking the right balance and prioritizing the right points of emphasis is always a challenge. My philosophy as a coach is to surround a team with as many capable resources as possible, so I’ve had as many as five or six coaches supporting the development of one youth basketball team. A coach for every couple of players. May sound like overkill, but I contend we are far more effective developing individual skills and more importantly, conveying life skills. 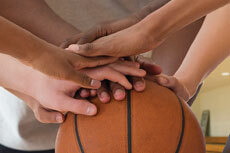 This past basketball season, with my son’s team, we committed to platooning and everyone getting equal playing time. We won the first couple of games during a tournament in January. I believed we could go on to win the tournament if we provided most of the playing time to six or seven kids. I mentioned this thought to one of my assistant coaches. We stuck with our process, and we did not win that tournament. But it was a good dose of perspective for me. Yet as the season went on, sure enough, all of our team members were able to contribute in meaningful ways. I see some fantastic organizations that do some great work with coaches; the Positive Coaching Alliance and Fellowship of Christian Athletes come to mind. It’s important that coaches have the proper perspective. At the Y, we’re not in it to build Division 1 athletes. We focus on instilling life skills and values in a way that kids take away something they will use for a lifetime. We’re seeking to put systems in place that hold us accountable to a very high values-driven bar. We must hire the right coaches and invest in them. Be clear about expectations and give them the tools to focus on the right things. At the same time, we teach kids that competition is good and that not everyone is entitled to a medal. There are winners and losers, and you may or may not get the job, you may or may not make the team, and you may or may not earn that first chair. Disappointment comes early and often, and we have to teach our children how to deal with disappointment. In one of our videos, a father named Kevin sums it up perfectly. In the other video, Chris said playing basketball at the Y has given his six-year-old daughter Brooklyn confidence. We’re fortunate that Kevin and Chris have entrusted the Y to help provide their kids the opportunity to learn basketball, have fun and make friends, and we do not take that responsibility lightly. It is not about how these youth perform on the field that matters, rather how they will perform in life that will make all the difference.